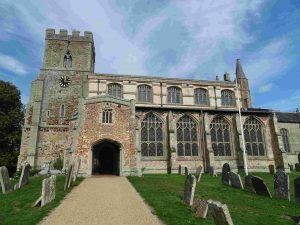 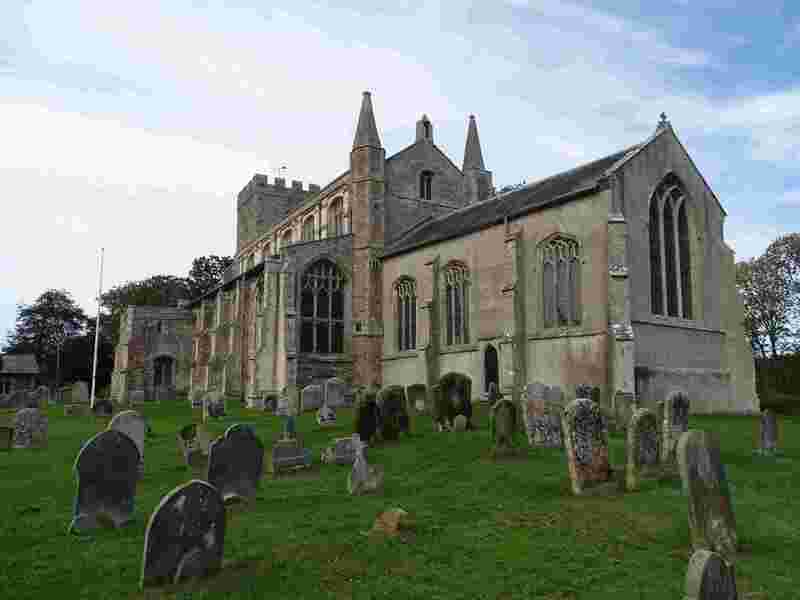 The next church was in Wiggenhall, grid reference TF 598113, excellent website. 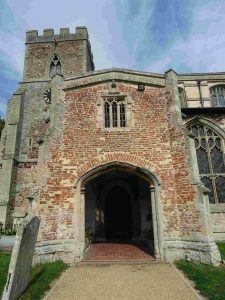 The base of the tower is C13, the top early C14. There are six bells, and the clock commemorates Queen Victoria’s Diamond Jubilee. 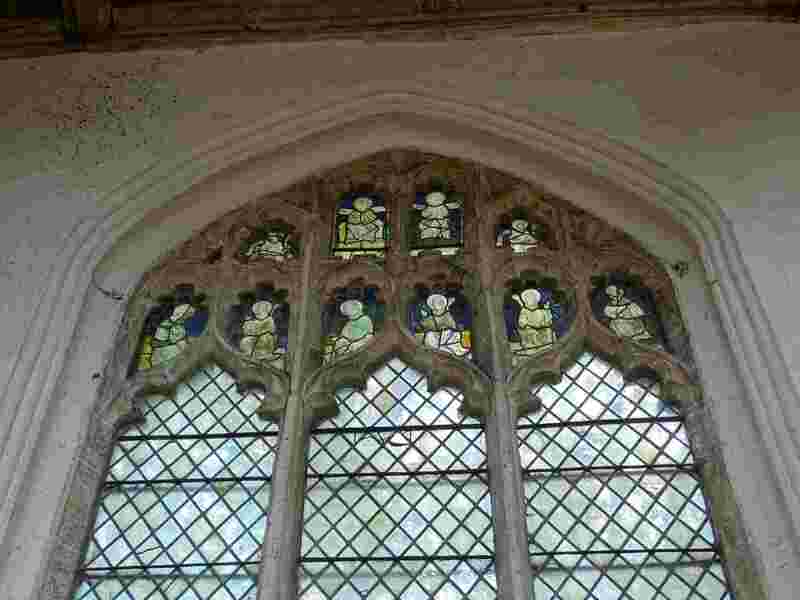 Most of the church is C15, lovely windows and lots of light. 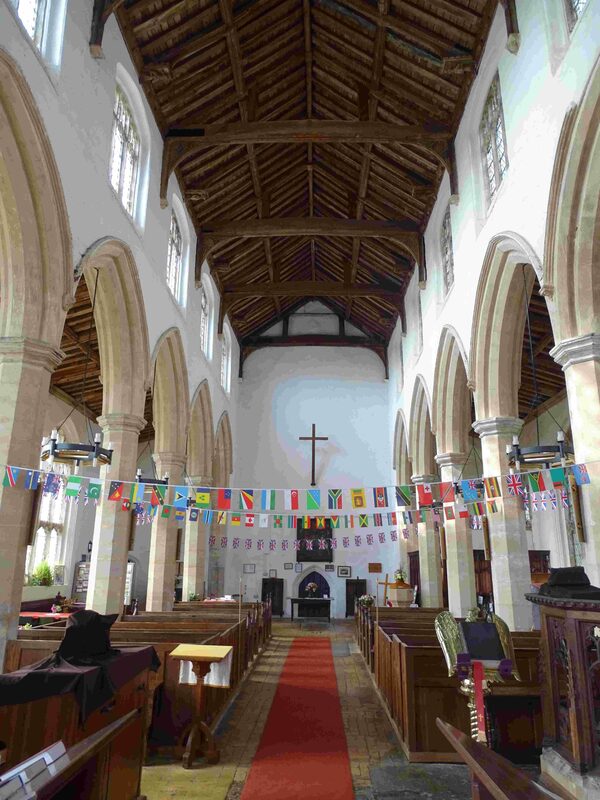 We know that in 1431 Philip Mayner left 5 marks for the building campaign. 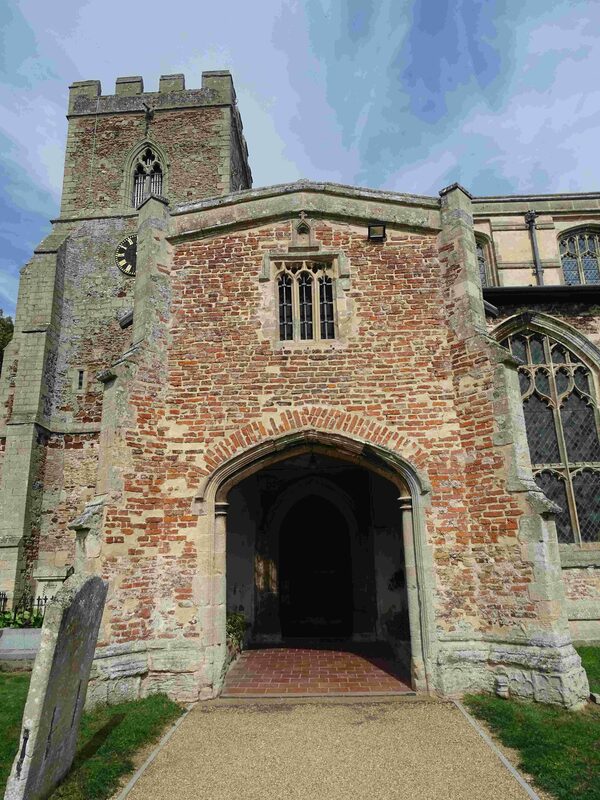 I like the little brick turrets at the east end of the nave – stairs to the rood. One side is round, the other is octagonal. 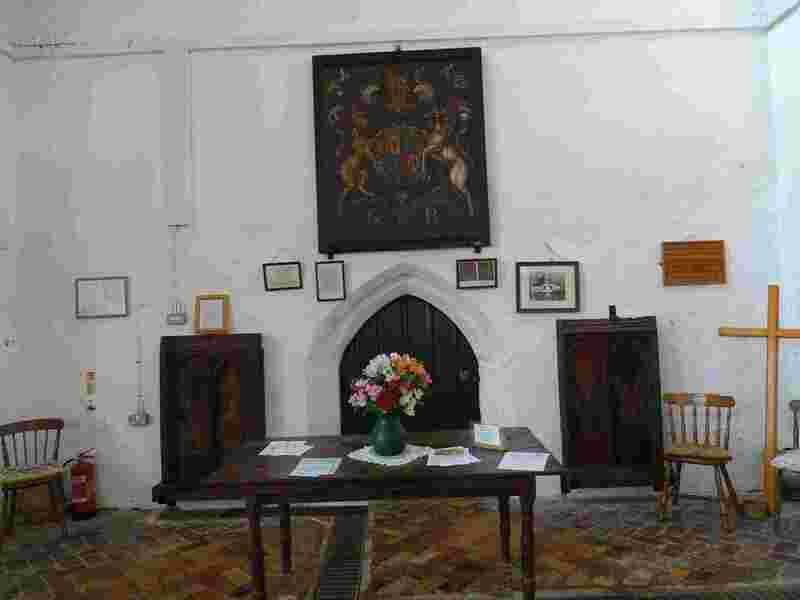 The brick porch used to have an upper room, once a school room. 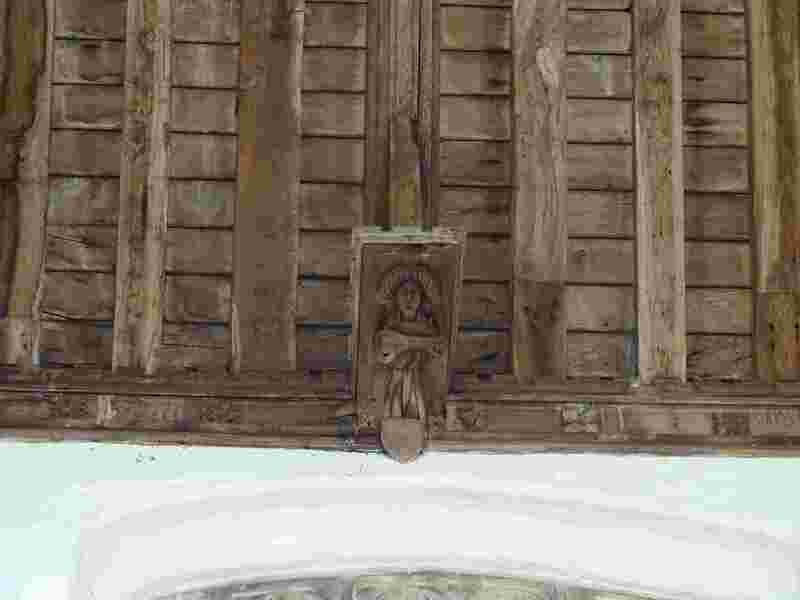 The two sets of arms over the doors in the spandrels of the C15, on the left the Ingoldisthorp family, on the right the Howards, the family name of the Duke of Norfolk. 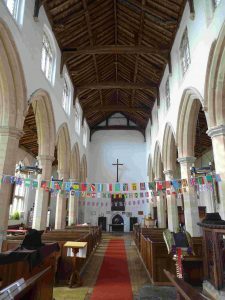 Inside the church makes you look up, and they had the flags out for my visit. 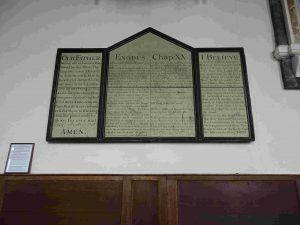 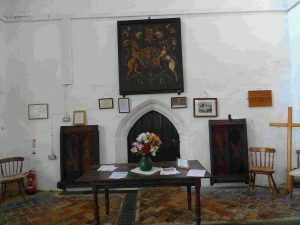 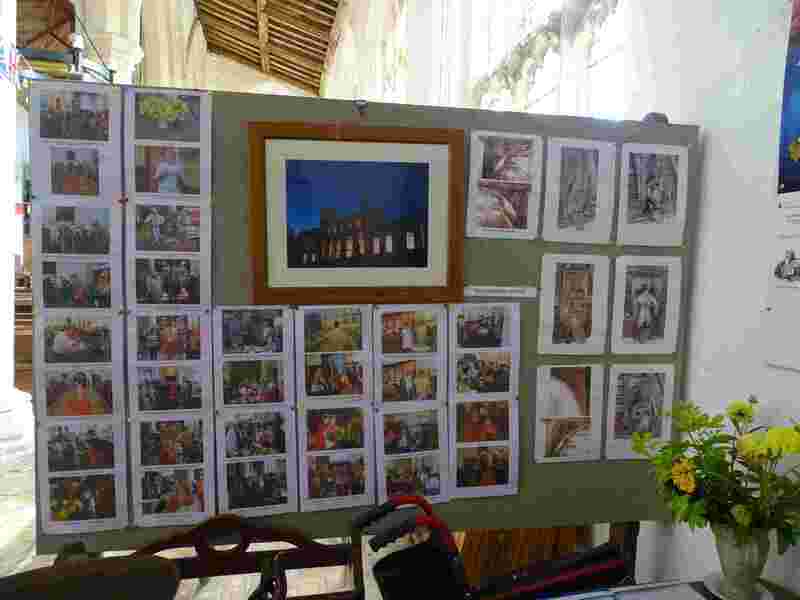 The South aisle is available for refreshments, and there is a nice welcoming board. 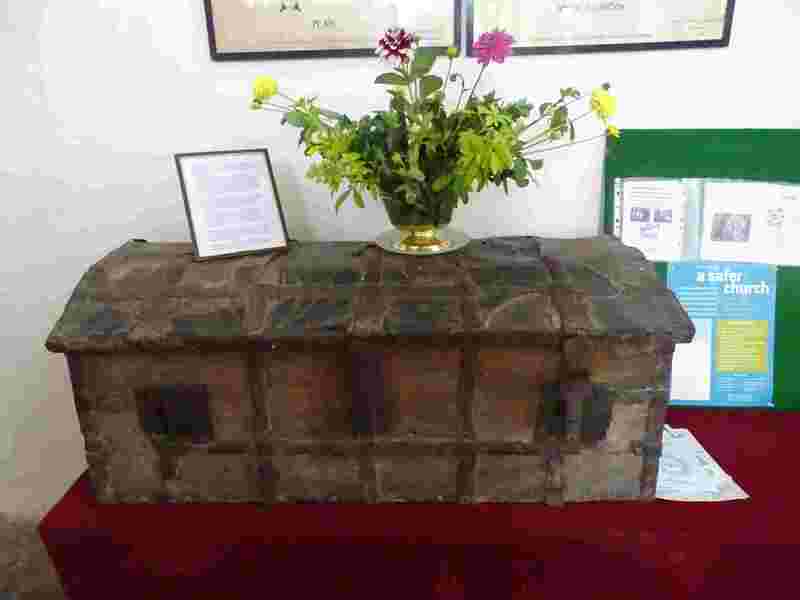 The chest is a Hanseatic chest, made of pin with a lime wood lid, leather and iron bound. 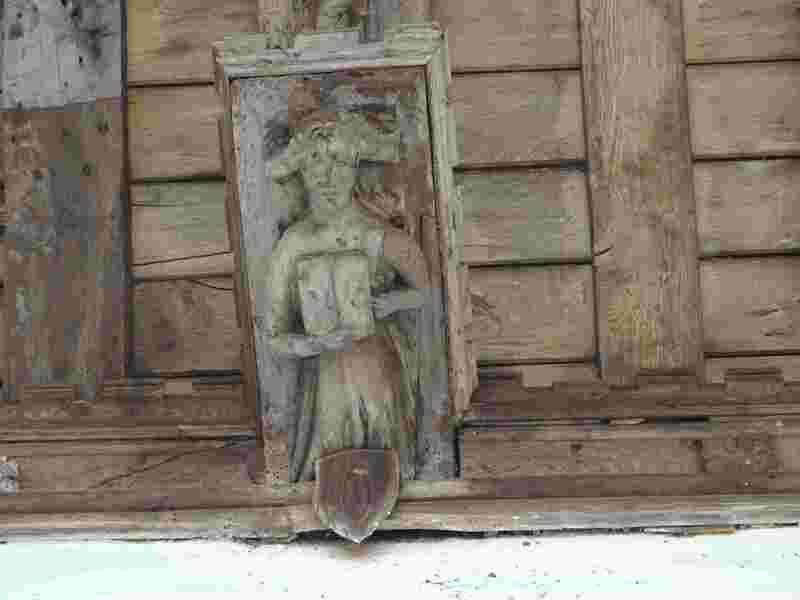 It was imported from Gdansk about 1420, and has the initials A.F. 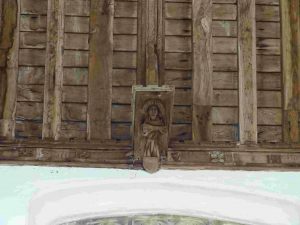 (probably a churchwarden). 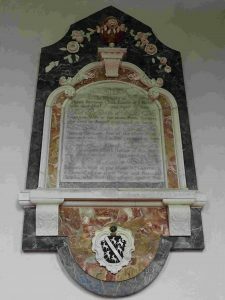 The Royal Arms of George III is signed and dated, which is unusual – painted by Parlett in 1787. 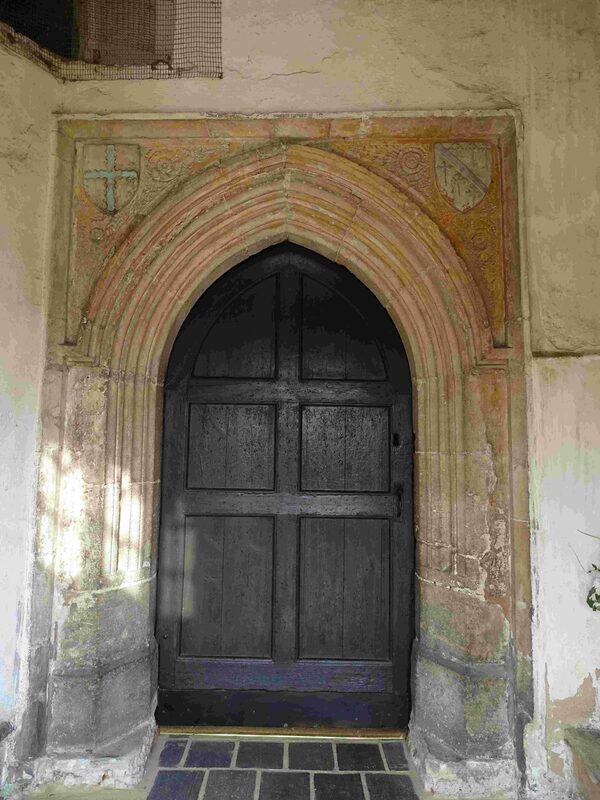 Each side of the door and entrance to the tower hang four panels, pained the with symbols of the four Evangelists. 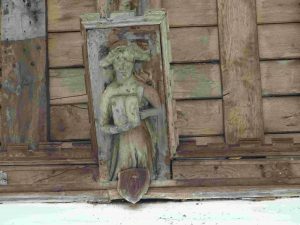 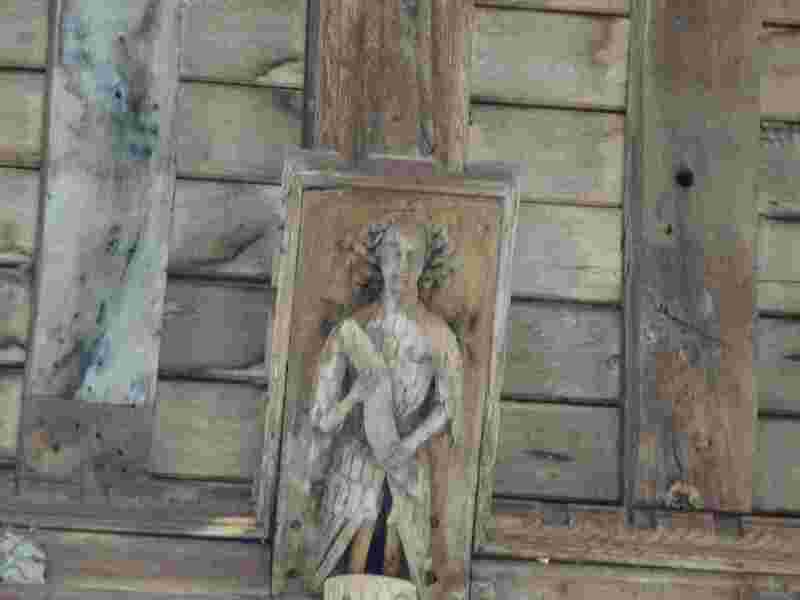 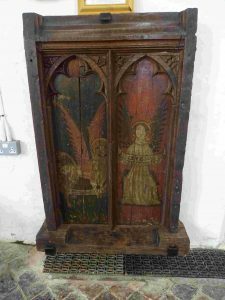 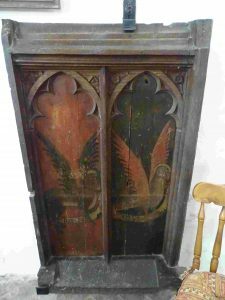 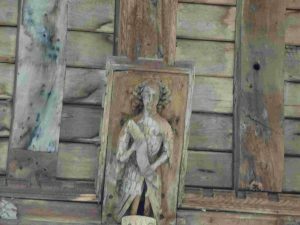 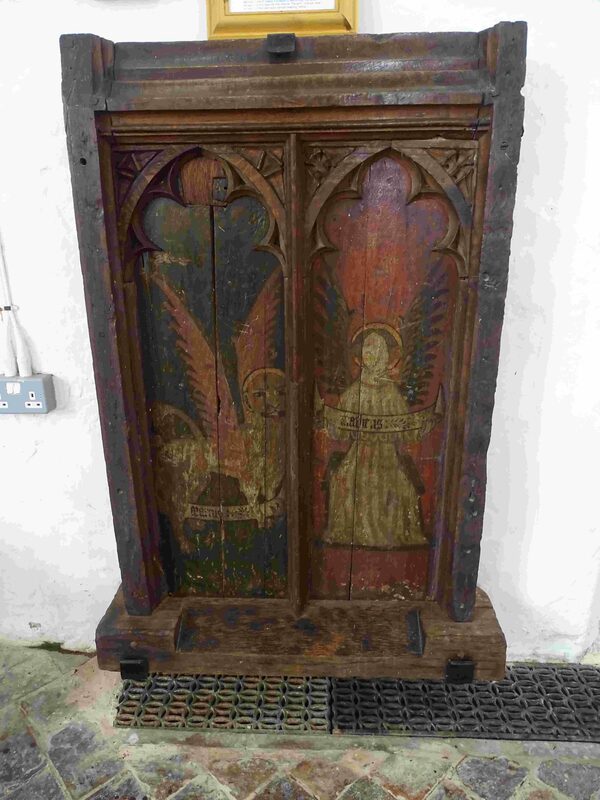 They are survivors from the Rood Screen. 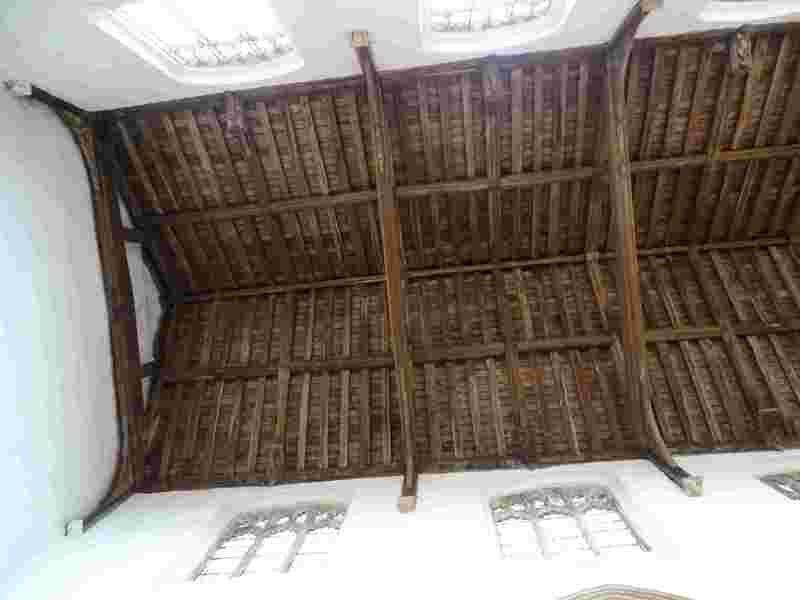 Let’s look up to the roof. 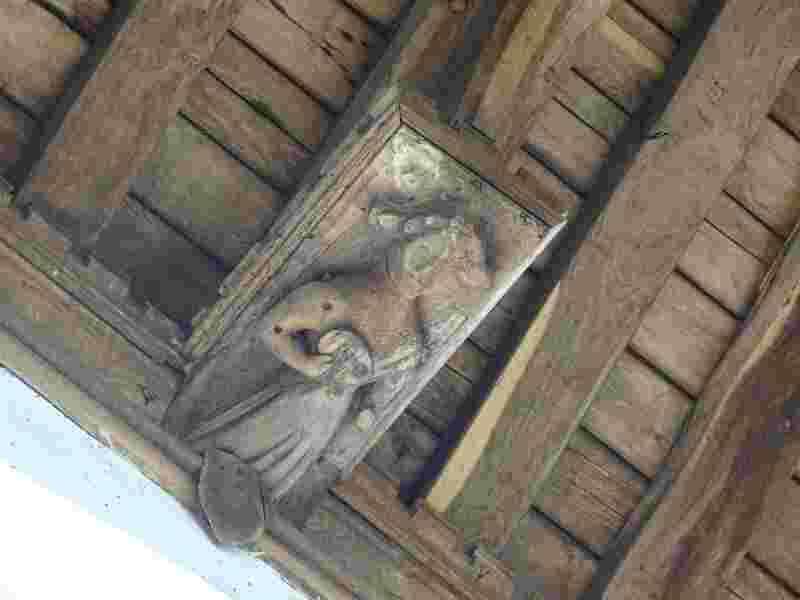 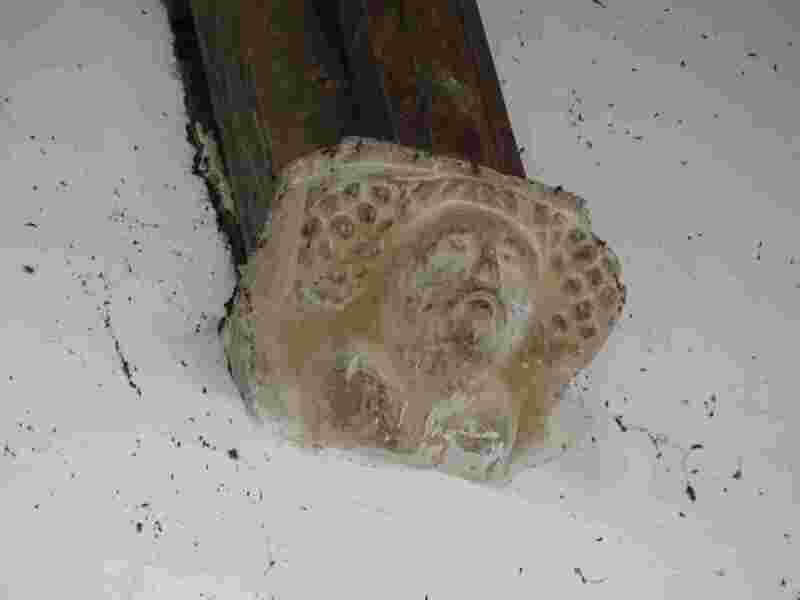 It has arch-braced tie beams and queen posts alternating with short hammer beams with figures. 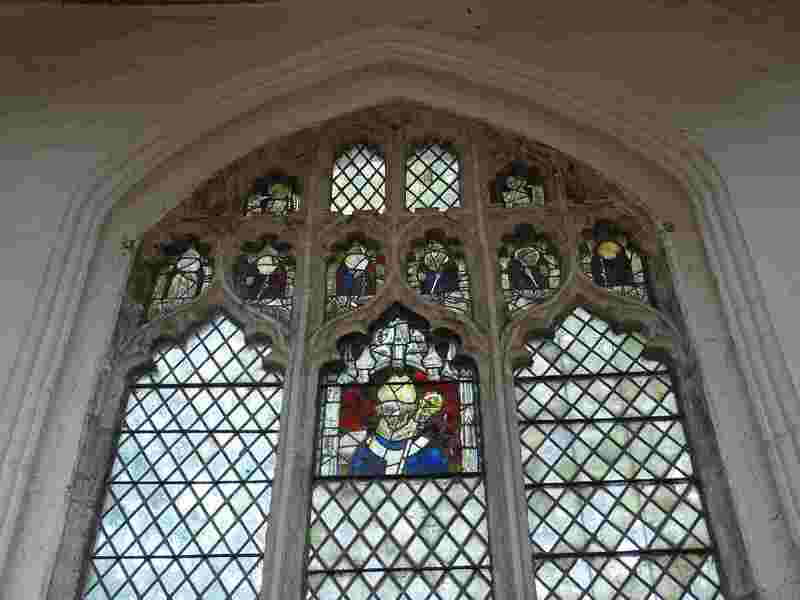 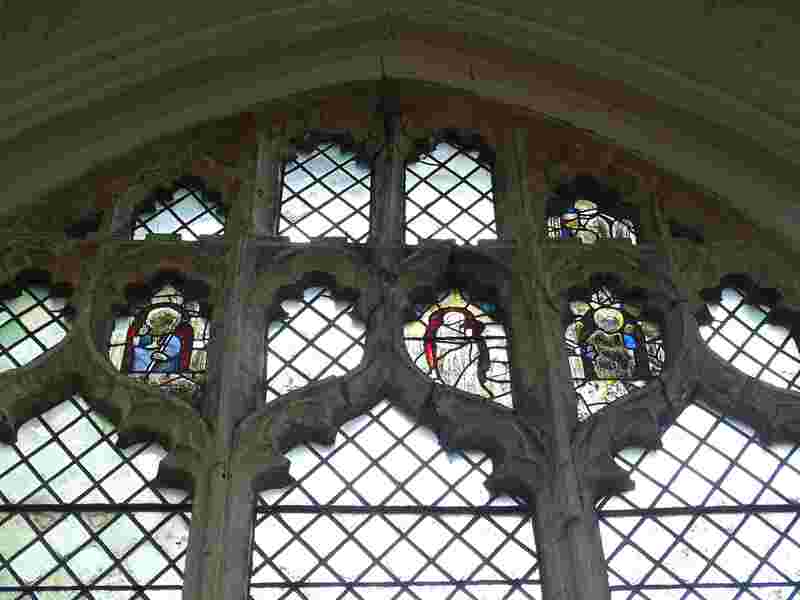 In the North Aisle we have medieval stained glass. 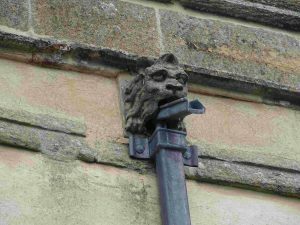 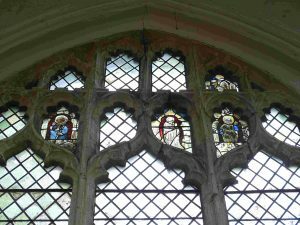 It is said to have been given about 1470 by Isabel, daughter of Sir Edward de Ingoldisthorp and wife of John Neville, Lord Montacute. Recent research has suggested the saints are based on those listed in the litanies of the Sarum Breviary – a vivid illustration of the litany, providing a focus for the prayers of the congregation while it was being sung. 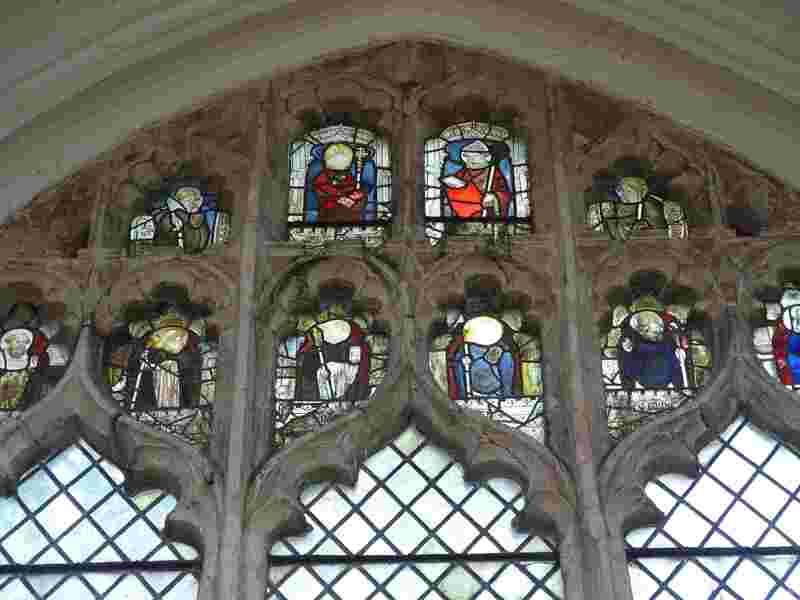 We have saints as obscure as St Callistus, St Britius and St Sixtus – you can look them up! 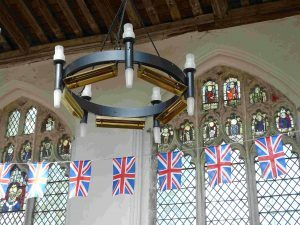 I like the combined lights and heaters – very neat. 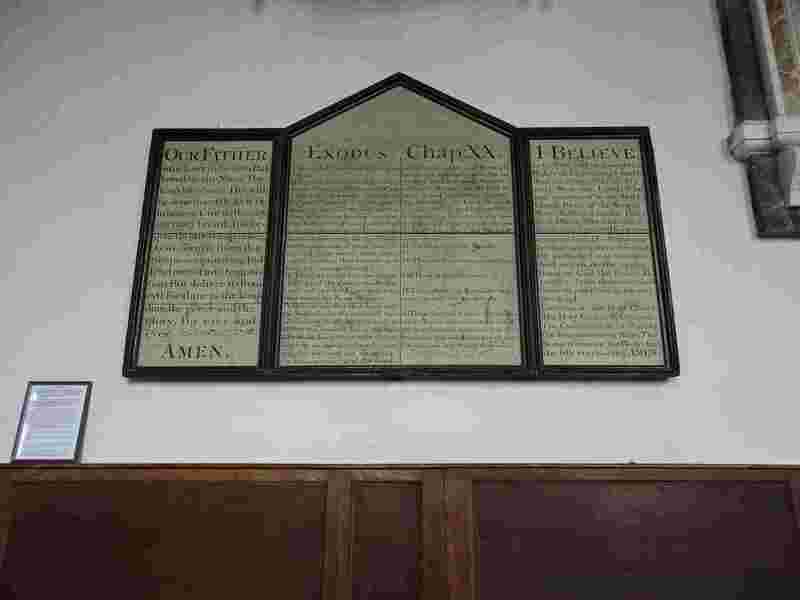 Other things to enjoy is the C18 Commandment Board – probably by the same painter as the George III coat of arms. 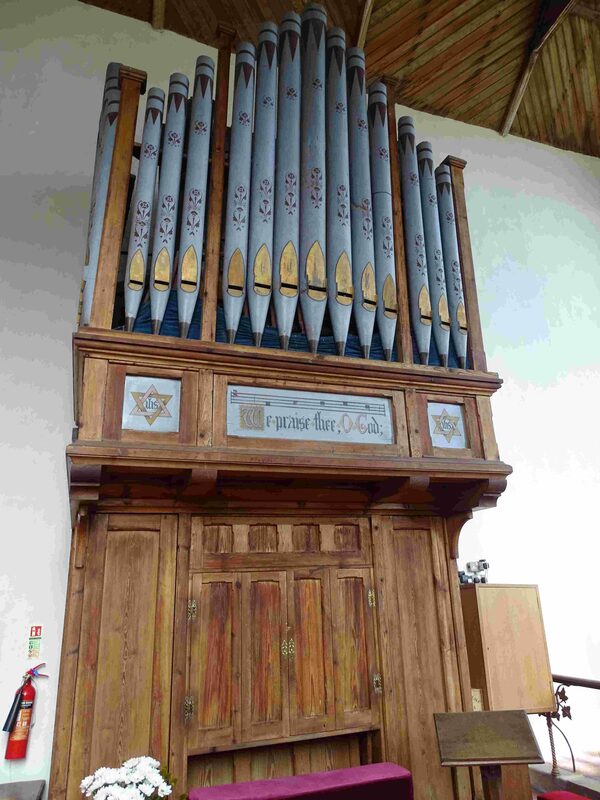 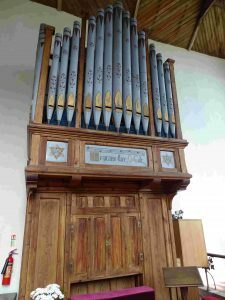 The Organ is by Dixon of Cambridge, installed in 1874 for £126. The guide says it has reached the end of its useful life. 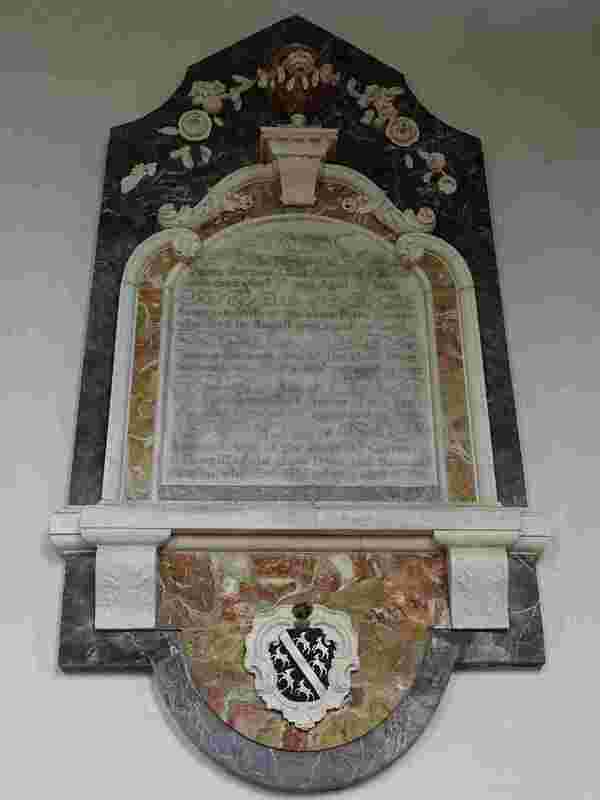 The Memorial is to Peter Bateson, rector, 1725, his wife Susanna and son Thomas. 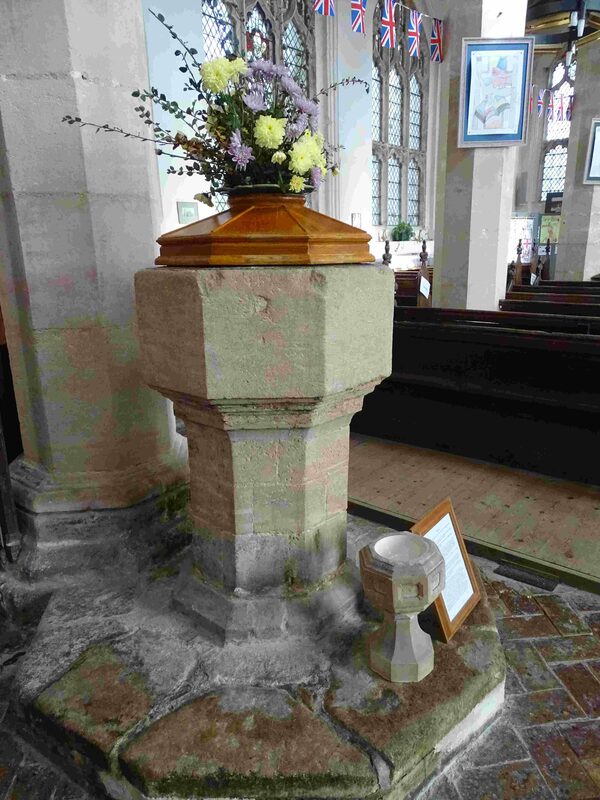 The Font is probably C14. 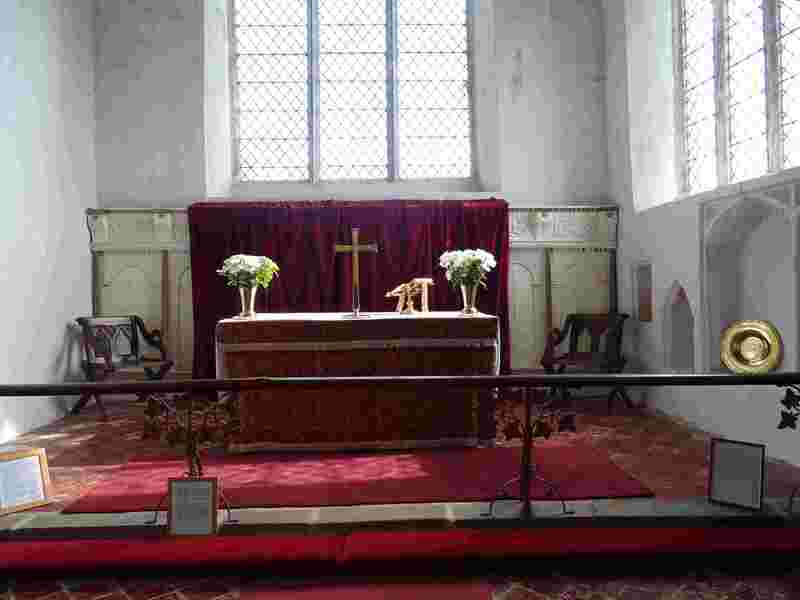 The Altar Table is Stuart, C17, and the panelling along the east wall of the Chancel is of the same period. 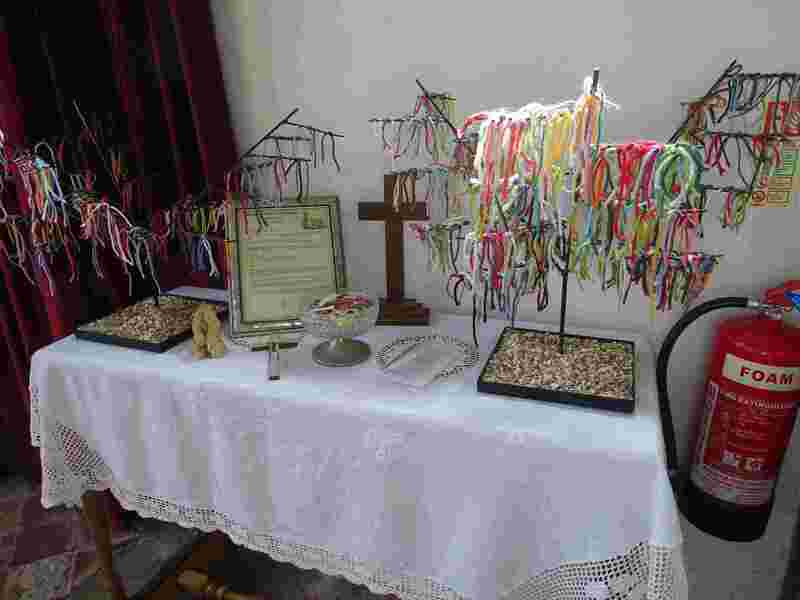 I like the Prayer Table – I keep saying I need to do something about a prayer space at St Edmund’s, this might be an idea. None of my photos show the fact that the chancel is not quite straight with the nave – the idea of a weeping chancel, Christ on the cross with his head on one side. The gargoyle is splendid. 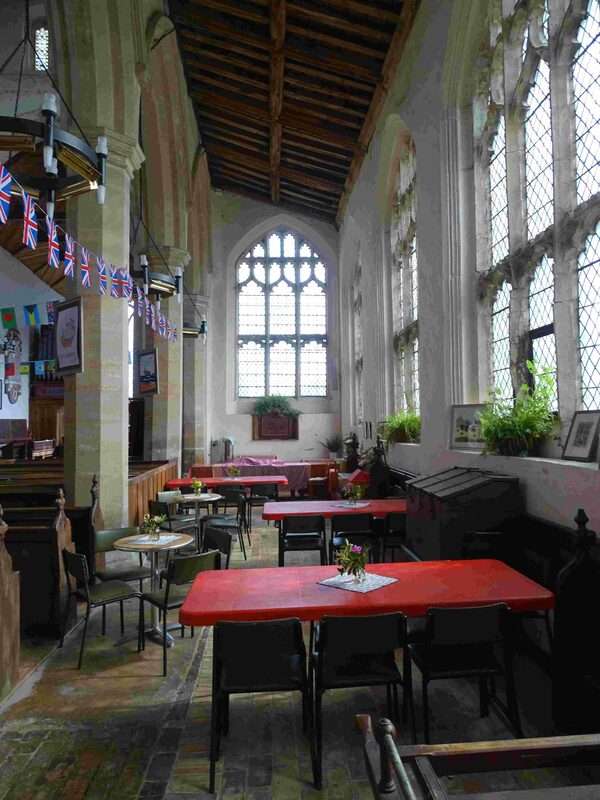 The parish spent a lot on rainwater goods in 2004, the loo and kitchen in 2008, and the lights/heat in 2012. 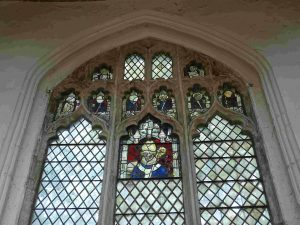 Next comes restoration of the tower, south aisle and medieval stained glass in 2019. 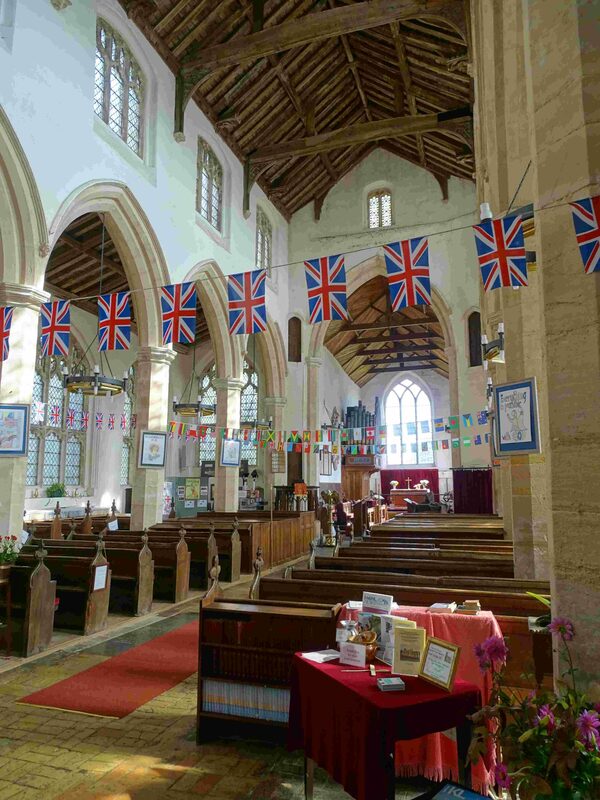 Thank you good people of Wiggenhall.